"Sticky rice" redirects here. For the Chinese rice dish, see Chinese sticky rice. In China, glutinous rice has been grown for at least 2,000 years. Glutinous rice is grown in Laos, Thailand, Cambodia, Vietnam, Malaysia, Indonesia, Myanmar, Nepal, Bangladesh, Northeast India, China, Japan, Korea, Taiwan, and the Philippines. An estimated 85% of Lao rice production is of this type. The rice has been recorded in the region for at least 1,100 years. The improved rice varieties (in terms of yield) adopted throughout Asia during the Green Revolution were non-glutinous, and Lao farmers rejected them in favor of their traditional sticky varieties. Over time, higher-yield strains of glutinous rice have become available from the Lao National Rice Research Programme. By 1999, more than 70% of the area along the Mekong River Valley were of these newer strains. Glutinous rice is distinguished from other types of rice by having no (or negligible amounts of) amylose, and high amounts of amylopectin (the two components of starch). Amylopectin is responsible for the sticky quality of glutinous rice. The difference has been traced to a single mutation that was selected for by farmers. Like all types of rice, glutinous rice does not contain dietary gluten (i.e. does not contain glutenin and gliadin), and should be safe for gluten-free diets. Glutinous rice can be used either milled or unmilled (that is, with the bran removed or not removed). Milled glutinous rice is white and fully opaque (unlike non-glutinous rice varieties, which are somewhat translucent when raw), whereas the bran can give unmilled glutinous rice a purple or black color. Black and purple glutinous rice are distinct strains from white glutinous rice. In developing Asia, there is little regulation, and some governments have issued advisories about toxic dyes being added to colour adulterated rice. Both black and white glutinous rice can be cooked as discrete grains, or ground into flour and cooked as a paste or gel. Sticky rice is used in many recipes throughout Southeast and East Asia. Sticky rice called bora saul is the core component of Assamese sweets, snacks, and breakfast. This rice is widely used in the traditional sweets of Assam, which are very different from the traditional sweets of India whose basic component is milk. Such traditional sweets in Assam are Pitha (Narikolor pitha, Til pitha, Ghila pitha, Tel pitha, Kettle pitha, etc.). Also, its powder form is used as breakfast or other light meal directly with milk. They are called Pitha guri (If powder was done without frying the rice, by just crushing it after soaking) or Handoh guri (If rice is dry fried first, and then crushed). The soaked rice is also cooked with no added water inside a special kind of bamboo (called sunga saul bnaah). This meal is called sunga saul. During religious ceremonies, Assamese people make Mithoi (Kesa mithoi and Poka mithoi) using Gnud with it. Sometimes Bhog, Payakh and Khir are also made from it using milk and sugar with it. In Bangladesh, especially in the Chittagong, Cox’s Bazar and Sylhet areas, the sticky rice called bini dhan(unhusked sticky rice) is very popular. Both white and pink varieties are cultivated at many homestead farms. Husked sticky rice is called bini choil (chal) in some dialects. Boiled or steamed bini choil is called Bini Bhat. With meat or fish curry and grated coconut, Bini Bhat is a popular breakfast. Sometimes it is eaten with a splash of sugar, salt, and coconut only without any curry. Bin dhan also used to make khoi (pop rice like popcorn) and chida (bitten husked rice). A part of these many other sweet items made of bini choil are popular. One of the favorite pitas made of bini choil is atikka pita (pita).It is made with the mixture of cubed or small sliced coconut, sugar or brown sugar, ripe banana and bini choil wrapped with banana leaf and steamed. Another delicacy is Patishapta pita made of ground bini choil. Ground bini choil is sprayed over a hot pan and a mixture of grated coconut, sugar, milk powder; then ghee is sprayed over that and rolled out. Dumplings made of powdered fried bini choil called laru. First bini choil is fried and ground into flour. This flour is mixed with sugar or brown sugar, and ghee or butter and is made into small balls or dumplings. One kind of porridge or khir made of bini choil is called modhu (honey) bhat. This modhu bhat becomes naturally sweet without mixing any sugar. It is one of the delicacies of local people. To make modhu bhat first prepare some normal paddy or rice (dhan) for germination by soaking it in the water for few days. After coming out of little sprout dry the paddy and husk and grind the husked rice called jala choil into flour. It tastes sweet. Mixing this sweet flour with freshly boiled or steamed warm bini bhat and then fermenting the mixture overnight yields modhu bhat. It is eaten either on its own or with milk, jaggery or grated coconut. Glutinous rice, called kao hnyin (ကောက်ညှင်း), is very popular in Myanmar (also known as Burma). Kao hnyin baung (ကောက်ညှင်းပေါင်း) is a breakfast dish with boiled peas (pèbyouk) or with a variety of fritters, such as urad dal (baya gyaw), served on a banana leaf. It may be cooked wrapped in a banana leaf, often with peas, and served with a sprinkle of salted toasted sesame seeds and often grated coconut. The purple variety, known as kao hynin ngacheik (ကောင်းညှင်းငချိမ့်), is equally popular cooked as ngacheik paung. They may both be cooked and pounded into cakes with sesame called hkaw bouk, another favourite version in the north among the Shan and the Kachin, and served grilled or fried. The Htamanè pwè festival (ထမနဲပွဲ) takes place on the full moon of Dabodwè(တပို့တွဲ) (February), when htamanè (ထမနဲ) is cooked in a huge wok. 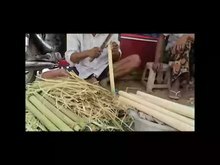 Two men, each with a wooden spoon the size of an oar, and a third man coordinate the action of folding and stirring the contents, which include kao hnyin, ngacheik, coconut shavings, peanuts, sesame and ginger in peanut oil. Si htamin (ဆီထမင်း) is glutinous rice cooked with turmeric and onions in peanut oil, and served with toasted sesame and crisp-fried onions; it is a popular breakfast like kao hnyin baung and ngacheik paung. Paung din (ပေါငျးတငျ) or "Kao hyin kyi tauk" (ကောင်းညှင်းကျည်တောက်) is another ready-to-eat portable form cooked in a segment of bamboo. When the bamboo is peeled off, a thin skin remains around the rice and also gives off a distinctive aroma. Glutinous rice (Paung din type) preparation in Myanmar. Mont let kauk (မုန့်လကျကေါကျ) is made from glutinous rice flour; it is donut-shaped and fried like baya gyaw, but eaten with a dip of jaggery or palm sugar syrup. Nga pyaw douk (ငပျောထုပ်) or "Kao hynin htope" (ကောင်းညှင်းထုပ်), banana in glutinous rice, wrapped in banana leaf and steamed and served with grated coconut - another favourite snack, like kao hnyin baung and mont let kauk, sold by street hawkers. Mont lone yei baw (မုန့်လုံးရေပေါ်) are glutinous rice balls with jaggery inside, thrown into boiling water in a huge wok, and ready to serve as soon as they resurface. Their preparation is a tradition during Thingyan, the Burmese New Year festival. Htoe mont (ထိုးမုန့်), glutinous rice cake with raisins, cashews and coconut shavings, is a traditional dessert for special occasions. It is appreciated as a gift item from Mandalay. In the Chinese language, glutinous rice is known as nuòmǐ (糯米) or chu̍t-bí (秫米) in Hokkien. Glutinous rice is also often ground to make glutinous rice flour. This flour is made into niangao and sweet-filled dumplings tangyuan, both of which are commonly eaten at Chinese New Year. It also used as a thickener and for baking. Glutinous rice or glutinous rice flour are both used in many Chinese bakery products and in many varieties of dim sum. They produce a flexible, resilient dough, which can take on the flavors of whatever other ingredients are added to it. Cooking usually consists of steaming or boiling, sometimes followed by pan-frying or deep-frying. Sweet glutinous rice is eaten with red bean paste. Nuòmǐ fàn (糯米飯), is steamed glutinous rice usually cooked with Chinese sausage, chopped Chinese mushrooms, chopped barbecued pork, and optionally dried shrimp or scallop (the recipe varies depending on the cook's preference). Zongzi (Traditional Chinese 糭子/糉子, Simplified Chinese 粽子) is a dumpling consisting of glutinous rice and sweet or savory fillings wrapped in large flat leaves (usually bamboo), which is then boiled or steamed. It is especially eaten during the Dragon Boat Festival, but may be eaten at any time of the year. It is popular as an easily transported snack, or a meal to consume while traveling. It is a common food among Chinese in Hong Kong, Singapore and Malaysia. Cifangao (Traditional Chinese 糍飯糕, Simplified Chinese 糍饭糕) is a popular breakfast food originating in Eastern China consisting of cooked glutinous rice compressed into squares or rectangles, and then deep-fried. Additional seasoning and ingredients such as beans, zha cai, and sesame seeds may be added to the rice for added flavour. It has a similar appearance and external texture to hash browns. Cifantuan (Traditional Chinese 糍飯糰, Simplified Chinese 糍饭团) is another breakfast food consisting of a piece of youtiao tightly wrapped in cooked glutinous rice, with or without additional seasoning ingredients. Japanese onigiri resembles this Chinese food. Lo mai gai (糯米雞) is a dim sum dish consisting of glutinous rice with chicken in a lotus-leaf wrap, which is then steamed. It is served as a dim sum dish in Hong Kong, Singapore, and Malaysia. Ba bao fan (八寶飯), or "eight treasure rice", is a dessert made from glutinous rice, steamed and mixed with lard, sugar, and eight kinds of fruits or nuts. Chinese glutinous rice pancake or "Chinese pizza"
A distinctive feature of Hakka cuisine is its variety of steamed snack-type buns, dumplings and patties made with a dough of coarsely ground rice, or ban. Collectively known as "rice snacks", some kinds are filled with various salty or sweet ingredients. Common examples of rice snacks made with ban from glutinous or sticky rice and non-glutinous rice[further explanation needed] include Aiban (mugwort patty), Caibao (turnip bun)[This 'turnip' is not the Western turnip. The proper name is yam bean. [In Mandarin Chinese, it is known as dòushǔ(豆薯) or liáng shǔ (涼薯)] Ziba (sticky rice balls) and Bantiao (Mianpaban or flat rice noodles). Aiban encompasses several varieties of steamed patties and dumplings of various shapes and sizes, consisting of an outer layer made of glutinous ban dough filled with salty or sweet ingredients. It gets its name from the aromatic ai grass (mugwort), which after being dried, powdered and mixed with the ban, gives the dough a green color and an intriguing tea-like taste. Typical salty fillings include ground pork, mushrooms, and shredded white turnips. The most common sweet filling is made with red beans. Caibao is a generic term for all types of steamed buns with various sorts of filling. Hakka-style caibao are distinctive in that the enclosing skin is made with glutinous rice dough in the place of wheat flour dough. Besides ground pork, mushrooms and shredded turnips, fillings may include ingredients such as dried shrimp and dry fried-shallot flakes. Ziba is glutinous rice dough which, after steaming in a big container, is mashed into a sticky, putty-like mass from which small patties are formed and coated with a layer of sugary peanut powder. It has no filling. In the Philippines, glutinous rice is known as malagkit in Tagalog or pilit in Visayan, among other names. Both meaning "sticky". The most common way glutinous rice is prepared in the Philippines is through soaking uncooked glutinous rice in water or coconut milk (usually overnight) and then grinding it into a thick paste (traditionally with stone mills). This produces a rich and smooth viscous rice dough known as galapóng, which is the basis for numerous rice cakes in the Philippines. However, in modern preparation methods, galapong is sometimes made directly from dry glutinous rice flour (or from commercial Japanese mochiko), with poorer-quality results. Galapong was traditionally allowed to ferment, which is still required for certain dishes. A small amount of starter culture of microorganisms (tapay or bubod) or palm wine (tubâ) may be traditionally added to rice being soaked to hasten the fermentation. These can be substituted with yeast or baking soda in modern versions. Other versions of galapong may also be treated with wood ash lye. Aside from the numerous white and red glutinous rice cultivars, the most widely used glutinous rice heirloom cultivars in the Philippines are tapol and pirurutong rice, both of which have colors ranging from purple, reddish brown, to almost black. However both varieties are expensive and becoming increasingly rare, thus some Filipino recipes nowadays substitute it with dyed regular glutinous rice or infuse purple yam (ube) to achieve the same coloration. Dessert delicacies in the Philippines are known by the umbrella term kakanin (from kanin, "prepared rice"). These were originally made primarily from rice, but in recent centuries, the term has come to encompass dishes made from other types of flour, including corn flour (masa), cassava, wheat, and so on. Glutinous rice figures prominently in two main subtypes of kakanin: the puto (steamed rice cakes), and the bibingka (baked rice cakes). Both largely utilize glutinous rice galapong. A notable variant of puto is puto bumbong, which is made with pirurutong. Other kakanin that use glutinous rice include suman, biko, and sapin-sapin among others. There is also a special class of boiled galapong dishes like palitaw, moche, mache, and masi. Fried galapong is also used to make various types of buchi, which are the local Chinese-Filipino versions of jian dui. They are also used to make puso, which are boiled rice cakes in woven leaf pouches. Aside from kakanin, glutinous rice is also used in traditional Filipino rice gruels or porridges known as lugaw. They include both savory versions like arroz caldo or goto which are similar to Chinese-style congee; and dessert versions like champorado, binignit, and ginataang mais. Glutinous rice is known as beras ketan or simply ketan in Java and most of Indonesia, and pulut in Sumatra. It is widely used as an ingredient for a wide variety of sweet, savoury or fermented snacks. Glutinous rice is used as either hulled grains or milled into flour. It is usually mixed with santan, meaning coconut milk in Indonesian, along with a bit of salt to add some taste. Glutinous rice is rarely eaten as a staple. One example is lemang, which is glutinous rice and coconut milk cooked in bamboo stem lined by banana leaves. Glutinous rice is also sometimes used in a mix with normal rice in rice dishes such as nasi tumpeng or nasi tim. It is widely used during the Lebaran seasons as traditional food. It is also used in the production of alcoholic beverages such as tuak and brem bali. Ketan - traditionally refers to the glutinous rice itself as well as sticky rice delicacy in its simplest form. The handful mounds of glutinous rice are rounded and sprinkled with grated coconut, either fresh or sauteed as serundeng. Ketupat - square shaped crafts made from the same local leaves as palas, but it is usually filled with regular rice grains instead of pulut, though it depends on the maker. Gandos - a snack made from ground glutinous rice mixed with grated coconut, and the fried. Tumpeng - glutinous rice can be made into tumpeng nasi kuning, yellow rice colored by turmeric, and shaped into a cone. Variety of kue - glutinous rice flour is also used in certain traditional local desserts, known as kue, such as kue lapis. Dodol - traditional sweets made of glutinous rice flour and coconut sugar. Similar variants are wajik (or wajit). Lupis - glutinous rice wrapped in individual triangles using banana leaves and left to boil for a few hours. The rice pieces are then tossed with grated coconut all over and served with palm sugar syrup. Gemblong - white glutinous rice flour balls smeared with palm sugar caramel. In East Java, it was known as getas, except it's using black glutinous rice flour as the main ingredient. In addition, glutinous rice dishes adapted from other cultures are easily available. Examples include kue moci (mochi, Japanese) and bacang (zongzi, Chinese). In Japan, glutinous rice is known as mochigome [mō-chee-gōmay] (Japanese: もち米). It is used in traditional dishes such as sekihan is known as the red rice, okowa, and ohagi. It may also be ground into mochiko (もち粉) a rice flour, used to make mochi (もち) which are known as sweet rice cakes to the non-Japanese, mochi a traditional rice cake prepared for the Japanese New Year but also eaten year-round. See also Japanese rice. In Korea, glutinous rice is called chapssal (Hangul: 찹쌀), and its characteristic stickiness is called chalgi (Hangul: 찰기). Cooked rice made of glutinous rice is called chalbap (Hangul: 찰밥) and rice cakes (Hangul: 떡, ddeok) are called chalddeok or chapssalddeok (Hangul: 찰떡, 찹쌀떡). Chalbap is used as stuffing in samgyetang (Hangul: 삼계탕). Glutinous rice is the main rice eaten in Laos (see Lao cuisine), where it is known as khao niao (Lao: ເຂົ້າໜຽວ): "khao" means rice, and "niao" means sticky. It is cooked by soaking for several hours and then steaming in a bamboo basket or houat (Lao: ຫວດ). After that, it should be turned out on a clean surface and kneaded with a wooden paddle to release the steam; this results in rice balls that will stick to themselves but not to fingers. The large rice ball is kept in a small basket made of bamboo or tip khao (Lao: ຕິບເຂົ້າ). The rice is sticky but dry, rather than wet and gummy like non-glutinous varieties. The fingers of the right hand are used to eat it by wadding the rice. Laotians consume glutinous rice as part of their main diet; they also use toasted glutinous rice khao khoua (Lao:ເຂົ້າຄົ່ວ) to add a nut-like flavor to many dishes. A popular Lao meal is a combination of Lao grilled chicken ping kai (Lao:ປີ້ງໄກ່), Lao papaya salad tam mak houng (Lao:ຕຳໝາກຫູ່ງ), and Lao sticky rice (khao niao). Khao Niao has also been used for preparing a popular dish from Laos called Naem Khao (or Laotian crispy rice salad). It is made with deep-fried sticky rice balls, chunks of Lao-style fermented pork sausage called som moo, chopped peanuts, grated coconut, sliced scallions or shallots, mint, cilantro, lime juice, fish sauce, and other ingredients. Khao niao is also used as an ingredient in desserts. Khao niao mixed with coconut milk can be served with ripened mango or durian. Khao tôm (Lao:ເຂົ້າຕົ້ມ) is a steamed mixture of khao niao with sliced fruits and coconut milk. Inang-inang - glutinous rice cracker. Popular in Melaka. Kelupis - a type of glutinous rice kuih in East Malaysia. Kochi - Malay-Peranakan sweet and sticky kuih. Lamban - another type of glutinous rice dessert in East Malaysia. Lemang - wrapped in banana leaves and inside a bamboo, and left to be barbecued/grilled on an open fire, to make the taste and texture tender and unique. Pulut inti – wrapped in banana leaf in the shape of a pyramid, this kuih consists of glutinous rice with a covering of grated coconut candied with palm sugar. Pulut panggang – glutinous rice parcels stuffed with a spiced filling, then wrapped in banana leaves and char-grilled. Depending on the regional tradition, the spiced filling may include pulverised dried prawns, caramelised coconut paste or beef floss. In the state of Sarawak, the local pulut panggang contains no fillings and are wrapped in pandan leaves instead. Tapai - cooked glutinous rice fermented with yeast, wrapped in banana, rubber tree or roseapple leaves. In Thailand, glutinous rice is known as khao niao (Thai: ข้าวเหนียว; lit. "sticky rice") in central Thailand and Isan, and as khao nueng (Thai: ข้าวนึ่ง; lit. "steamed rice") in northern Thailand. Northern Thais (Lanna people) and northeastern Thais traditionally eat glutinous rice as their staple food. Southern and central Thais, and northeastern Thais from Surin Province and neighboring areas influenced by the Khmer-Thai people favor non-sticky khao chao. Steamed glutinous rice is one of the main ingredients in making the sour-fermented pork skinless sausage called naem, or its northern Thai equivalent chin som, which can be made from pork, beef, or water buffalo meat. It is also essential for the fermentation process in the northeastern Thai sausage called sai krok Isan. This latter sausage is made, in contrast to the first two, with a sausage casing. Sweets and desserts: Famous among tourists in Thailand is khao niao mamuang (Thai: ข้าวเหนียวมะม่วง): sweet coconut sticky rice with mango, while khao niao tat, sweet sticky rice with coconut cream and black beans, Khao niao na krachik (Thai: ข้าวเหนียวหน้ากระฉีก), sweet sticky rice topped with caramelized roasted grated coconut, khao niao kaeo, sticky rice cooked in coconut milk and sugar and khao tom hua ngok, sticky rice steamed with banana with grated coconut and sugar, are traditional popular desserts. Khao lam (Thai: ข้าวหลาม) is sticky rice with sugar and coconut cream cooked in specially prepared bamboo sections of different diameters and lengths. It can be prepared with white or dark purple (khao niao dam) varieties of glutinous rice. Sometimes a few beans or nuts are added and mixed in. Thick khao lam containers may have a custard-like filling in the center made with coconut cream, egg and sugar. Khao chi (Thai: ข้าวจี่) are cakes of sticky rice having the size and shape of a patty and a crunchy crust. In order to prepare them, the glutinous rice is laced with salt, often also slightly coated with beaten egg, and grilled over a charcoal fire. They were traditionally made with leftover rice and given in the early morning to the children, or to passing monks as offering. Khao pong (Thai: ข้าวโป่ง) is a crunchy preparation made of leftover steamed glutinous rice that is pounded and pressed into thin sheets before being grilled. Khao tom mat (Thai: ข้าวต้มมัด), cooked sticky rice mixed with banana and wrapped in banana leaf, khao ho, sticky rice molded and wrapped in conical shape, khao pradap din, kraya sat and khao thip are preparations based on glutinous rice used as offerings in religious festivals and ceremonies for merit-making or warding off evil spirits. Khao khua (Thai: ข้าวคั่ว), roasted ground glutinous rice, is indispensable for making the northeastern Thai dishes larb, nam tok, and nam chim chaeo. Some recipes also ask for khao khua in certain northern Thai curries. It imparts a nutty flavor to the dishes in which it is used. Glutinous rice is also used as the basis for the brewing of sato (Thai: สาโท), an alcoholic beverage also known as "Thai rice wine". Bánh chưng: a square-shaped, boiled glutinous rice dumpling filled with pork and mung bean paste, wrapped in a dong leaf, usually eaten in Vietnamese New Year. Bánh giầy: white, flat, round glutinous rice cake with tough, chewy texture filled with mung bean or served with Vietnamese sausage (chả), usually eaten in Vietnamese New Year with bánh chưng. Bánh dừa: glutinous rice mixed with black bean paste cooked in coconut juice, wrapped in coconut leaf. The filling can be mung bean stir-fried in coconut juice or banana. Bánh rán: a northern Vietnamese dish of deep-fried glutinous rice balls covered with sesame, scented with jasmine flower essence, filled with either sweetened mung bean paste (the sweet version) or chopped meat and mushrooms (the savory version). Bánh cam: a southern Vietnamese version of bánh rán. Unlike bánh rán, bánh cam is coated with a layer of sugary liquid and has no jasmine essence. Bánh trôi: made from glutinous rice mixed with a small portion of ordinary rice flour (the ratio of glutinous rice flour to ordinary rice flour is typically 9:1 or 8:2) filled with sugarcane rock candy. Bánh gai: made from the leaves of the "gai" tree (Boehmeria nivea) dried, boiled, ground into small pieces, then mixed with glutinous rice, wrapped in banana leaf. The filling is made from a mixture of coconut, mung bean, peanuts, winter melon, sesame, and lotus seeds. Bánh cốm: the cake is made from young glutinous rice seeds. The seeds are put into a water pot, stirred on fire, juice extracted from pomelo flower is added. The filling is made from steamed mung bean, scraped coconut, sweetened pumpkin, and sweetened lotus seeds. Xôi lá cẩm: made with the magenta plant. Xôi lá dứa: made with pandan leaf extract for the green color and a distinctive pandan flavor. Xôi gà: made with coconut juice and pandan leaf served with fried or roasted chicken and sausage. Chè đậu trắng: made from glutinous rice and black-eyed peas. Chè con ong: made from glutinous rice, ginger root, honey, and molasses. Chè cốm: made from young glutinous rice seeds, kudzu flour, and juice from pomelo flower. Chè xôi nước: balls made from mung bean paste in a shell made of glutinous rice flour; served in a thick clear or brown liquid made of water, sugar, and grated ginger root. Cơm nếp: glutinous rice that is cooked in the same way as ordinary rice, except that the water used is flavored by adding salts or by using coconut juice, or soups from chicken broth or pork broth. Cơm rượu: Glutinous rice balls cooked and mixed with yeast, served in a small amount of rice wine. Cơm lam: Glutinous rice cooked in a tube of bamboo of the genus Neohouzeaua and often served with grilled pork or chicken. Glutinous rice can also be fermented to make Vietnamese alcoholic beverages, such as rượu nếp, rượu cần and rượu đế. According to legend, glutinous rice was used to make the mortar in the construction of the Great Wall of China. Chemical tests have confirmed that this is true for the city walls of Xi'an. In Assam also, this rice was used for building palaces during Ahom rule. Glutinous rice starch is often used as a vegetarian glue or adhesive. ^ Oxford English Dictionary. glutinous, a. SECOND EDITION 1989. Online edition. Retrieved 2008-02-20. ^ a b "NC State Geneticists Study Origin, Evolution of "Sticky" Rice" (Press release). 21 October 2002. Archived from the original on 13 September 2006. ^ Delforge, Isabelle (2001). "Laos at the crossroads". ^ Kenneth M. Olsen and Michael D. Purugganan (1 October 2002). "Molecular evidence on the origin and evolution of glutinous rice". Genetics. 162 (2): 941–950. PMC 1462305. PMID 12399401. ^ Kenneth F. Kiple, Kriemhild Coneè Ornelas. The Cambridge World History of Food. p. 143. ^ a b Amy Besa & Romy Dorotan (2014). Memories of Philippine Kitchens. Abrams. ISBN 9781613128084. ^ Nocheseda, Elmer. "The Invention of Happiness". Manila Speak. Retrieved 8 December 2018. ^ "Pirurutong at Tapol / Purple and White Glutinous Rice". Market Manila. Retrieved 11 February 2019. ^ "Purple, Red and White Malagkit / Sticky Rice". Market Manila. Retrieved 11 February 2019. ^ "Misa de Gallo and Puto Bumbong Pre-amble…". Market Manila. Retrieved 11 February 2019. ^ "Sweet Sticky Rice with Coconut Cream and Black Beans*(khao niao tat)". Board.palungjit.com. Archived from the original on 29 March 2012. Retrieved 2013-05-31. ^ "ข้าวเหนียวหน้ากระฉีก". The-than.com. Retrieved 2013-05-31. ^ "Thai food". Thailand.prd.go.th. Archived from the original on 24 April 2013. Retrieved 2013-05-31. ^ "Khao chi preparation". Webboard.sanook.com. Retrieved 2013-05-31. ^ "Sticky Rice with Bananas". Thai-blogs.com. 2005-09-29. Archived from the original on 3 June 2013. Retrieved 2013-05-31. ^ "Madam Mam Articles". Madammam.com. Archived from the original on 20 May 2013. Retrieved 2013-05-31. ^ "Sticky Rice Ball". Library.cmu.ac.th. Retrieved 2013-05-31. ^ "Kaeng Khae Hoi (snail curry)". Library.cmu.ac.th. Retrieved 2013-05-31. ^ Xinhua News Agency (27 February 2005). "Sticky porridge used to cement ancient walls". Archived from the original on 18 November 2007. Wikimedia Commons has media related to Glutinous rice.